Here is the thing…I don’t like snack food. I actually really hate it. Any of those crackers, cookies and most chips in the snack aisle. I just can’t pretend. I also don’t like to snack, but I won’t start on that topic because I could go on forever. I just strongly believe in eating three times a day (or at least a finite amount of times) is the way to go. These cheese straws are pretty much just crackers. But, the diff is, they are yummy. Even though I hate snacks, I do like the idea of these. They would be a really nice asset to a party with appetizers, because they could be made ahead of time. They are served room temp. And they are just fun and taste great. I took these to the V-day dance party too. Woohoo! In a food processor, combine the cheese, butter, flour, salt and red pepper in five 5-second pulses until the mixture resembles coarse crumbs. Add the half-and half and process until the dough forms a ball, about 10 seconds. to 1/3-inch wide (dipping the knife in flour after every few inches ensures a clean cut). Gently transfer the strips to an ungreased cookie sheet (though I lined mine with parchment), leaving at least 1/4-inch between them. The dough may sag or may break occasionally in the transfer, but don’t be concerned — just do your best. The straws can be any length, from 2 to 10 inches. Bake the straws on the middle rack for 12 to 15 minutes, or until the ends are barely browned. Remove from the oven and set the cookie sheet on a rack to cool. Serve at room temperature. 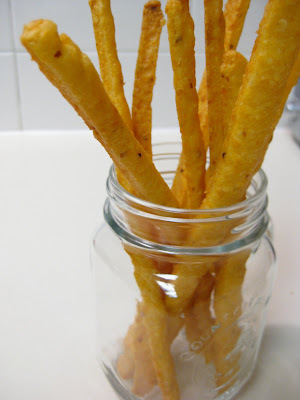 Cheese straws will keep in the refrigerator, in a sealed container, for two days. Oooooooo, maybe a wedding app option? Yes! I think we could swing that!